Oompa Loompa juice is a genius recipe that is capable of satisfying even the snobbiest of taste buds. It was so delicious that I got addicted to it on the first day. It was love at first sip. I named the concoction Oompa Loompa because it's color resembled that of an Oompa Loompa. Ironically, I also resembled the color because I was so addicted to this juice I drank it everyday sometimes more than once a day. After a week I started turning orange. No joke. 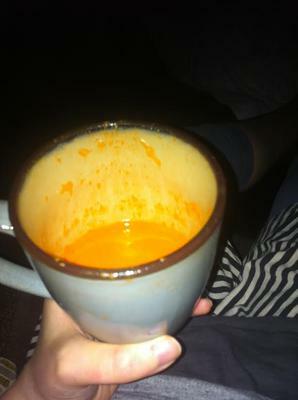 Beta-carotene addiction is nothing to scoff at however, I'd rather look like a cast member of Jersey Shore than to go a day without this wonderful juice of awesomeness. The benefits of this drink are many. My energy has greatly improved, I have better night vision (I don't recommend this drink to stalkers), my eyelashes started growing longer (this is beauty juice... If you drink it in moderation) and overall my body just feels better. So what's in this fantastical beverage of wonder? Hold your ponies that's what I'm getting to right now! Always refrigerate the carrots and apples you use. Enjoy yourself and the Oompa Loompa Juice! This was the first veggie juice I tried, and it's really nice. I'm really picky about food, I have a HUGE sweet tooth which isn't at all healthy. So I invested in a juicer. It's fantastic, so useful to find recipes like this one online. It's helping me expand my eating horizons whilst losing lots of weight and getting healthier. Just started the juice cleanse and have found it very hard to find yummy juices I like but this one is perfect! Carrot tops are not toxic, that is an urban myth. Any search of the internet will put you right on that. ****That's correct. The green tops are not, however if the top of the carrot has green on it that is. Just like potatoes.